Power Quick | Alpine Products, Inc.
POWER QUICK is specially formulated for the tough, heavy-duty cleaning jobs where ordinary detergents lack the punch to penetrate and remove dried-on or burnt-on deposits of oils, greases, lubricants, and other stubborn soils. POWER QUICK quickly cuts through stubborn films to leave surfaces sparkling clean. POWER QUICK pffers the following advantages over many other liquid products used for cleaning and degreasing. When used as directed, POWER QUICK will not effect brass, concrete, lead, bronze, copper, nickel, cadmium, iron, magnesium, stainless steel, chromium, glass, and rubber. 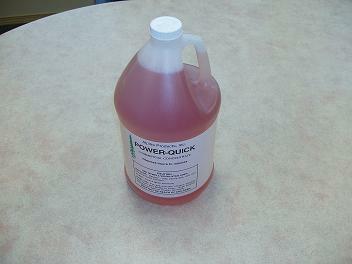 POWER QUICK can attack aluminum zinc, galvanized metals, and tin and may soften and strip certain paints and finishes. Not for use on soft flooring.